Ok, well November is here - as is crazy weather and weirdness. The end of October into November has been difficult as my severe culture shock ebbed into a relapse of major depression, but thanks to a miracle (most likely prayers and support from all of you), I woke up one day not so depressed, so we are hoping for better things this month. It has been raining like mad a few days, followed by lots of warm, beautiful days, and who knows what tomorrow will bring. Michael has had some nasty sickness attacking his throat this past week, but large amounts of garlic, essential oils, and other supplements I brought proved the winner and he is feeling better, although being able to trail his location based on smell was not pleasant. Seriously - he even brushed his teeth a few times and he still smelled like garlic. But at least the swelling is gone and he's feeling good again. (I think probiotics have been my saving grace for not getting sick yet - knock on wood). Anyhew, with the pumpkins we carved for Halloween, I decided I wanted to attempt making Pumpkin Pie. Problem was, I have no oven. So, I remembered hearing about baking cake in a rice cooker, so I figured "Why not Pie?" I googled it and some people had been successful (albeit with much fancier rice cookers than my 55,000 VND model), so we decided to try it. Here is my first attempt, with the pie crust in the rice cooker pan, that had been all buttered, and ready to go. First attempt - trying to cook. I had read about people having to keep the COOK button down on their rice cookers, so after a few different tries I found this solution. (If you don't use a rice cooker, it cooks based on weight or something so, when baking, it may not stay depressed all the time, so you have to do it manually). In the end..... the crust started to burn after 10 minutes or so and it made a big mess - but the filling was pretty good, although a little under done, and there was a bit of crust that wasn't burned that was pretty tasty. It was a nasty mess so I took no photo. But, I still had some dough and filling left over, so the next day we tried again. This time, I decided to try cooking the crust and pie separate, the crust in the skillet and the filling by steaming. Here's my skillet all buttered up. Crust in the pan, it was kind of hard getting it thin enough but not burning it - our gas stove is not the best, neither are the pans here - they are all SUPER thin, so everything cooks really fast or burns. This is how my crust turned out, kinda soft in some parts, but the thinner middle was flaky at least. Here's the filling, in the rice pot, in a large pot of water. I put a bigger lid on top of this and cooked it for about an hour and a half. It seemed to work! 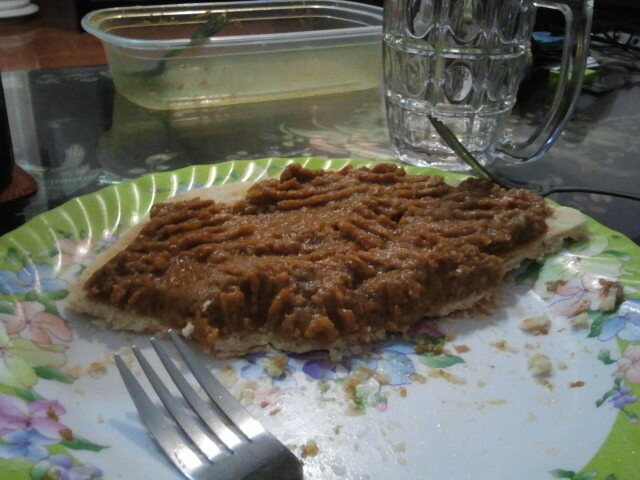 Here is the filling all steamed, it looked like pumpkin pie at least, the fork came out clean! The hardest part was getting the pie filling on the crust. It wasn't a pretty process so I waited until it looked appetizing before taking a photo. It kind of glopped all over and we had to spread it out, but in the end - success! My next attempt - steamed pumpkin chocolate chip cookies. It's daring, but we can dream, right? All right, sorry for the long dialogue. I was proud of myself, despite the nasty burned failure, if you couldn't tell. Anyhew, on to other ditties so far this month. A Dog On A Scooter - Seriously. I was on the side of the road and saw this dog-like head coming at me about wheel level, and it was a whole dog! The owner had a scooter with a flat floor between the seat and the front, like a Vespa, and the dog was sitting there between his legs. It wasn't a small dog either, it was a medium-sized black dog, about the size of an English Spaniel I would say. Totally nuts! I went to Metro, the huge Costco-like store here in town, to find spices for pumpkin pie, and they had a lot of Christmas decorations out! 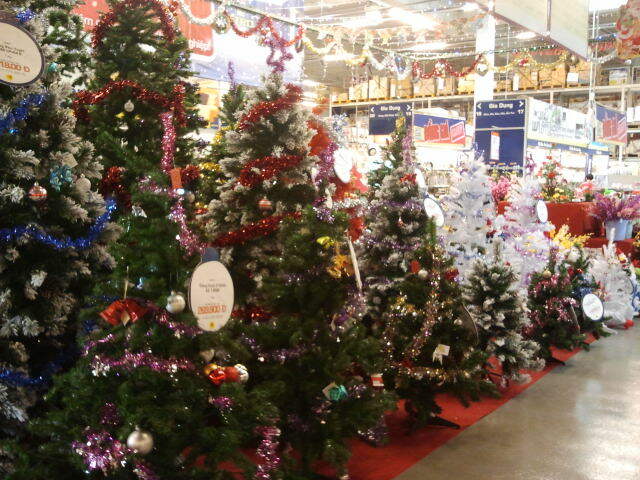 They were even playing X-mas music, I got to hear Jingle Bells in Vietnamese! Really weird. We might get a tree for xmas, the really big ones were about 1,5 million VND, but the smaller ones are a bit better priced. It's crazy, if you want a package of 3-4 stuffed Santa figures it was about 500,000 VND. Yes, that is an egg in the midde of the pizza. No, we had NO IDEA why. 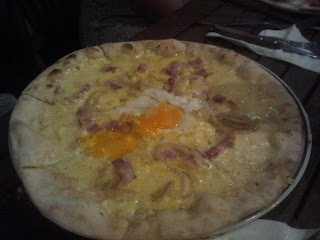 Luna is an Italian place that has pretty good western food, but we still had no idea why with the egg. And last, but not least - we got a lovely package from Mom and Pop Nielsen today, SO HAPPY! They sent us a lovely postcard with Mike Sr. and a desert lizard from Moab or St. George on the front, dental floss (I finally found it here but it is really expensive, thank you!! 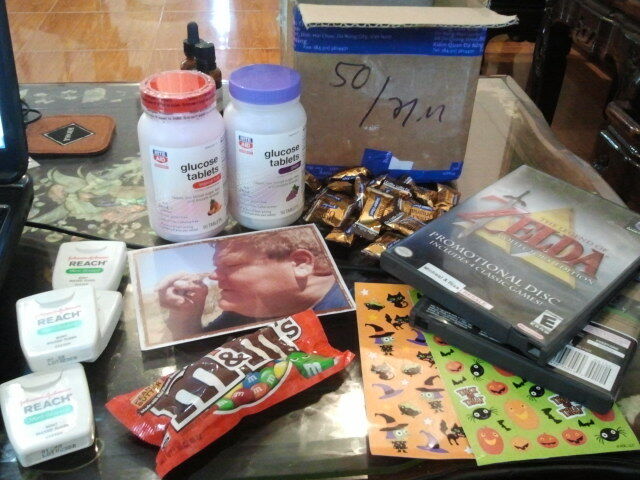 ), peanut butter M&M's - Michael's favorite kind, Halloween stickers (the girls at the office loved them), glucose tabs for Michael (still trying to figure out this diabetes thing with inferior medical supplies), some of our Zelda games, some guitar strings for a friend, and, just to torture me I'm sure - sugar free Worther's for Michael ('cuz it makes him stink...) - from Pop Nielsen. We love you guys! !